Did you know that there are between 80 and 100 different varieties of coffee grown worldwide? That, like wine, it only grows at a certain latitude: a “green belt” that falls entirely within the Tropics of Cancer and Capricorn? That the coffee bean, which produces the drink, is actually the seed of the fruit – a “cherry” – which grows on the coffee tree? That coffee grows on trees? That coffee flowers are snow-white and have a heady jasmine-like scent? That different terroirs produce different tastes and yields? That most of the coffee’s eventual flavour comes from the roast and a bad roast can ruin a good bean? That before they are roasted, coffee beans are green and hard like a wasabi pea? Me neither, at least not until I took a trip to Star Lane. For someone who drinks coffee every day, I knew very little about where it comes from, or what it even is. I was visiting Union Hand-Roasted Coffee to find out about the beans going into the new Berry Bros. & Rudd Coffee Liqueur. Star Lane is one of those places that probably didn’t have a name before they built a DLR station there. It’s an area of warehouse and industry not far from Canning Town, where the things the city needs to keep it humming are made, stored and disposed of. From the outside, the roastery is a fairly nondescript building next to a retirement depot for old ambulances – but inside it’s a veritable chocolate factory for grownups, where men in long white coats and beard-nets feed tubes of fresh coffee beans into Victorian-looking machines. The smell is one of a thousand breakfasts, in a good way. I’m being shown around by Jeremy Torz, co-founder of Union, which he set up with his partner Steven Macatonia in 2001. After years spent studying roasteries in San Francisco, they returned to Britain and resolved to invigorate its burgeoning coffee scene. While coffee might have recently earned its edgier credentials, it has been eagerly consumed in this country since the 17th century. Indeed, coffee was the first thing sold by the Widow Bourne when she opened her “Italian grocer’s” at No.3 St James’s Street in 1698. 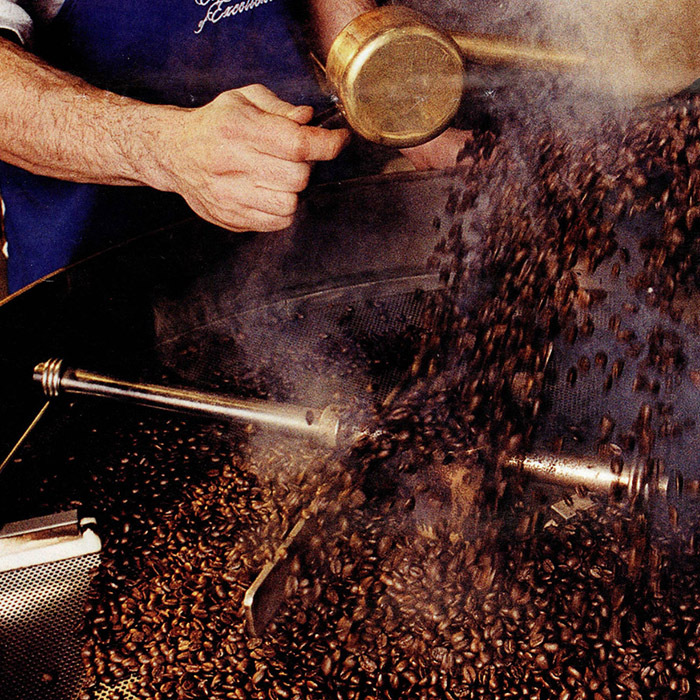 Eleven years earlier, in 1687, the coffee mill (grinder) had been invented, vastly improving the taste of the drink. It was this example of quality and modernity that Bourne decided to adopt as the symbol of her new business, and the sign of the coffee mill still hangs outside No.3 today. Bourne’s decision was a shrewd one: coffeehouses were springing up all over Europe and were places where patrons would gather to discuss the issues of the day over a dish – or small bowl – of warm, bitter, revivifying brew. After a few decades, No.3 began to deal exclusively in stronger stuff, but by then coffee was already a British staple. Nonetheless, that warm bitter brew supped in the 1600s didn’t improve too much in taste in the intervening 300 years. The great taste Jeremy and Steve encountered in California was what inspired them initially but this was soon joined by a commitment to ethical business. They were the first roasters in the UK to buy coffee directly from producers, meaning they could guarantee them a fair price. Today they source coffee from 40 producers in 14 countries scattered across the green belt and supply some of the biggest names on the High Street. Despite exponential growth, all their coffee is still roasted by hand and cupped (steeped in water and tasted) by specially trained tasters. The cupping room is really something: two wide-eyed tasters hovering over about 40 glass beakers dipping their spoons in for big slurps at regular intervals. “These guys have sold their beds!” Jeremy cheerfully announces, which is not exactly true – lots of beer and bananas is apparently their ticket to the land of nod. The presence of these expert palates is further evidence of the attention to detail that Union espouses. It’s this dedication to quality and fair practice that first attracted Berry Bros. & Rudd to the company – using its beans for in-house pours for the past few years. And it is the same reason why today, exactly 320 years after the Widow Bourne first started selling coffee to enervated Londoners, Berry Bros. & Rudd’s Coffee Liqueur is made with Union-Hand Roasted beans. The beans used for our new liqueur are Union’s Bobolink Selection from Brazil. It’s a single blend chosen from specific parcels in Fazenda Ambiental Forteleza, a farm in São Paolo state: “you need a bean that will maintain a balanced and stable flavour profile throughout the year and will marry well with liqueur,” Jeremy tells me. Created with the intention of making the easiest and best-tasting Espresso Martini, the liquid is infused not only with the finest ingredients but also the combined expertise of Berry Bros. & Rudd and Union Hand-Roasted Coffee. For the ultimate Espresso Martini: Simply add a shot of fresh coffee and shake over ice for a perfect caffeine cocktail. Find out more and buy a bottle of our Coffee Liqueur here.